There is one meal that all of my kids love and eat, every. single .time. It’s an easy copycat Olive Garden Alfredo Sauce that’s not only pretty much the creamiest deliciousness you’ve ever tasted, but it comes together in about 10 minutes! It’s one of my most favorite go-to quick meals for busy nights! 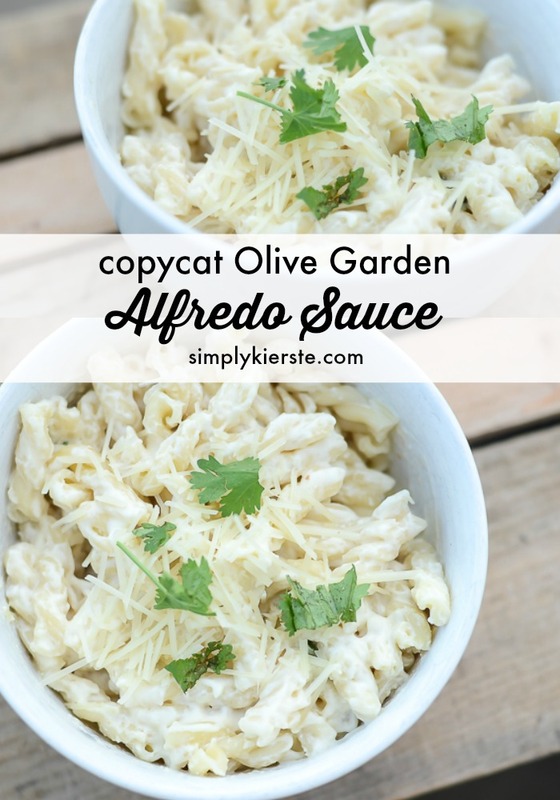 We love Olive Garden’s alfredo sauce, and this recipe tastes so much like it! This sauce is made with all the best stuff…butter, cream cheese, parmesan cheese, and milk. Yep, definitely not low fat, but simple, and AMAZING. The end result is a rich and creamy sauce with a nutty flavor that pretty much makes you want to eat the entire pan…with a spoon. If you want to take some of the calories out, you can substitute low-fat cream cheese. I’m always on the lookout for easy and fast recipes, especially during the school year. Between sports, music, and other activities and practices, our afternoons and evenings are booked most of the week. I’m so happy when I can throw together a scrumptious meal in a short period of time that I know my whole family will love. That’s pretty much perfection. Do you like your alfredo sauce on the thinner or thicker side? With this recipe, it’s easy to add more or less milk to make it just how you like it! My family tends to like it better on the thicker side, so I don’t use as much milk. I would start with the smallest amount of milk listed, then add a little more, a tablespoon at a time, until you get it to where you like it. I make this same Alfredo sauce but I omit the butter… It’s so good… I also put some cheddar in it for homemade Mac and cheese. Homemade Mac & Cheese….YUM!!!! That’s a great idea, I’m going to have to try it! How much cheese do you add? Thanks for sharing this recipe… It can be easily memorized too!! I don’t use the recipe, anymore. :) It’s definitely easy to memorize! Pinned this! This looks tasty and easy – something I definitely need with a toddler around. I can’t wait to try this recipe! I made this tonight and my family loved it. I used light cream cheese and 2% milk and it was still very thick! Thanks for another great recipe. Had this saved since you posted it & finally made it tonight. All I can say is wow so simple & delicious. The only thing I added was a minced clove of garlic. We’re kinda garlic-aholics ;o). The whole fam loved it!! !